As the world’s largest pork processor and hog producer, Smithfield Foods is passionate about producing good food the right way. 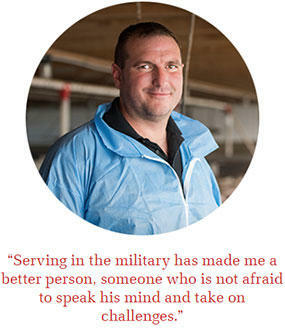 Military veterans understand the value of purposeful work, and approximately 1,700 of them play a daily role in advancing Smithfield’s success. Learn more about our exciting career opportunities for veterans. 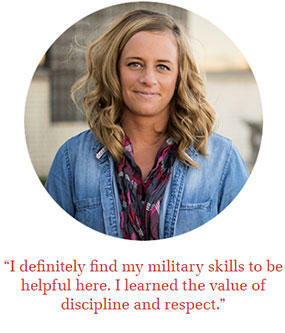 Kayla Baumfalk joined the Nebraska Army National Guard in 2003, and would spend 11 years in this reserve component of the U.S. military—one of them deployed to Iraq—before her honorable discharge in 2014. Throughout her time in the service, Baumfalk tried her hand at a few different civilian jobs. In 2010, she began at Smithfield’s Crete, Nebraska, plant. Baumfalk started out on the bacon line as an arranger and eventually became the administrative assistant to the general manager. She also chairs one of the plant’s safety teams. Jurmon Baker comes from a family with a history of military service, so joining the Army straight out of high school seemed like a logical decision for him. He served for five years with tours in Fort Riley, Fort Lewis, Fort Hood, and Darmstadt, Germany. Upon completing his five-year enlistment in 2001, he held the rank of E5 sergeant. Baker then earned an associate’s degree in Philosophy before going to work for a software collaboration firm in accounts payable. 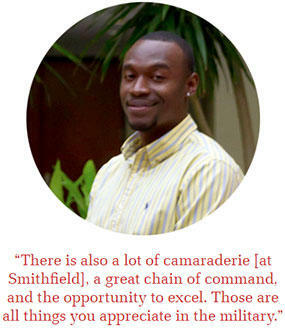 He joined Smithfield in 2016 and currently works as an international documentation coordinator for the company’s export business. Currently holding the rank of staff sergeant, Fineran enlisted in the Iowa Army National Guard in 1997 and deployed to Iraq in 2001 and Egypt in 2003. He has worked in the hog production industry for more than a decade, joining Smithfield in 2014 after a friend from the military suggested he apply. Smithfield has a long history of supporting military families through volunteerism, food and charitable donations and partnerships. In the past six years, we have donated more than $3 million to veteran-related causes. With two new initiatives, we’re working to do even more. Smithfield Salutes is our Employee Resource Group designed to "Promote hiring and engagement of veterans by building bridges of transition from the battlefield to Smithfield." Launched in 2017, this group works across the country to support our three pillars: Recruitment, Outreach, and Internal Engagement (ROI). Through our Operation 4000! initiative, we plan to increase the number of veterans in our U.S. workforce to 4,000 by the end of 2020. And you could be one of them.